Another one of my favourite deserts, is like having a Rum shot with every piece… hmmm, maybe that’s why I like them so much. Still, make sure you don’t drive or operate heavy machinery while under the influence of my Rum balls ;). This is by far the easiest recipe, ever. I mean, if you don’t feel adventurous you can use the super moist chocolate mix that you can find in any grocery store. The thing is so easy to make that you will get two cakes ready in no time, just read the instructions on the box :p.
Let the cake cool off completely, then crumble it in a big bowl (easy enough). Add all your other ingredients onto the crumbled cake and do some serious mixing. Add the Rum as well, about ¼ cup or… you can go nuts if desired ;). Use your hands until it becomes of nice smooth consistency. 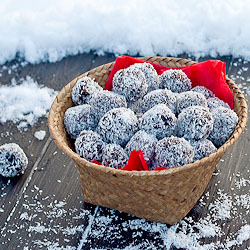 Roll the Rum balls as big as you want them and throw them inside a bowl in which you already have the fine shredded coconut. When you finished your composition you can start eating them. Heck you can eat as you roll them too, that’s what I did but at some point I couldn’t make them round anymore :). Bake the cake as per instruction found on the respective box. Let the cake cool off completely then crumble it in a big bowl, add powder sugar, rum, cocoa powder and the chopped pecans and mix well. 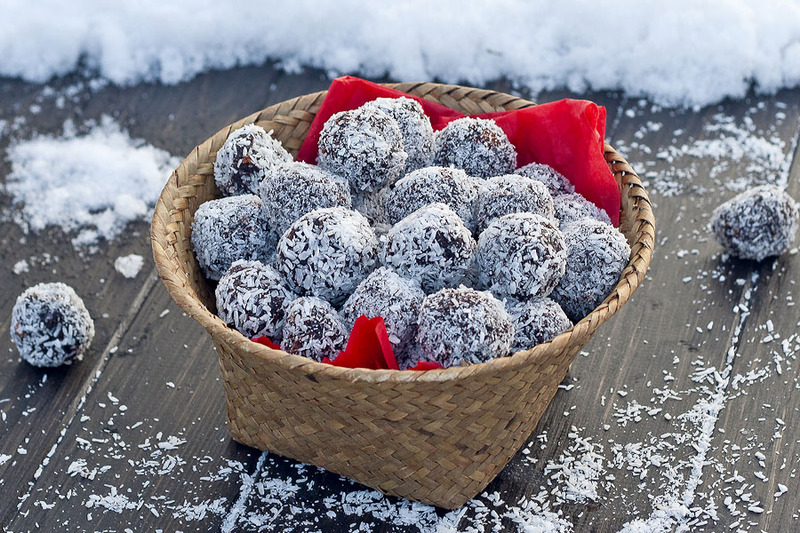 Roll the Rum balls as big as you want them and throw them inside a bowl in which you already have the fine shredded coconut. Have fun with a great desert. I have a question about Ur recipe. 1. how do you store these rum balls? 2. How long would you recommend these will keep? If I want to make these for presents for different occasions, I would need some type of a plan. This looks like a really good recipe. If you could let me know, that will be great. 1. I usually keep them in plastic containers, in the fridge. 2. I have no idea, we eat them pretty fast around here… two days tops :). However, given the necessary time to make these little things happen, I say just make them when you need them. Can rum flavoring be used instead of the actual rum? These would be great as gifts but the rum flavoring would be better for some people I know. Thanks! Rum is needed to moisten the cake so you can roll it into balls so no, you cannot. You need a specific quantity for that and flavoring might not be enough, besides it is way more stronger than regular rum. Can you add the rum to the cake mix before baking? No because you need some sort of moisture to make the crumble into balls. You won’t even feel the difference but I assume it will. These look terrific. I will definitely be making them soon. I cracked up when you wrote that at some point you couldn’t make them round anymore. That is my kind of dessert. Thanks for the recipe. These are definitely not for kids. I think I will try it with Root Beer and see how it works out. I am looking for easy recepies. Yeah not for kids unless you want to put them to sleep fast and early. Let me know how root beer replacement worked out for you. Sounds great !! Is the sugar powder ( powdered sugar in the box ? and ,i never used coco powder ( is it in a box or plastic bag ? I would love to make these, they look wonderful. On my side of the woods, powdered sugar is in a 1KG bag while cocoa is in a box. Hi, is the powdered sugar necessary? The cake is already sweet enough. How do these hold up? I am thinking of making a snowman rumball cake.. I want to make one really big one, and I’m hoping if I put it in the fridge it will harden enough to hold another smaller one, on top of it?